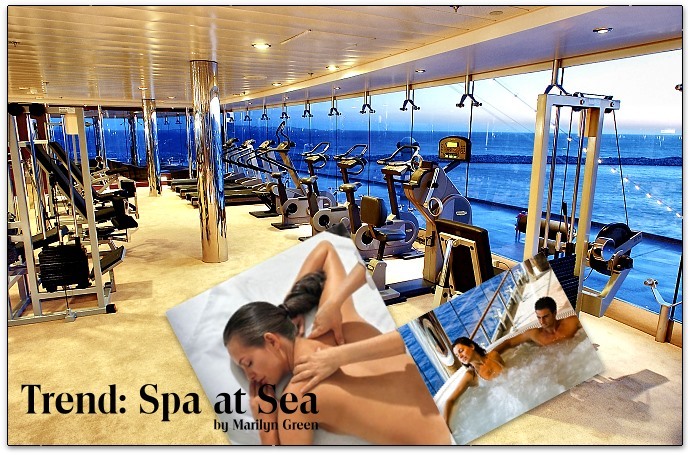 Spas have become huge business at sea, with ships eclipsing land-based spas in size and variety and fitness areas including everything from Pilates reformers to full-size boxing rings. Nearly every cruise line has incorporated low fat and sugar free selections and heart healthy choices, along with seminars in everything from reducing body fat to healthy hair. Italian-owned MSC Cruises has joined the ranks of the lines offering special fitness cruises and a VIP class with special access to the spa. MSC Cruises was founded in 1990 and speedily built eight new ships to add to their two classic vessels. They will debut the new Poesia this spring and the Fantasia in December, the Splendida in 2009 and the Magnifica in 2010. The line sails the Caribbean out of frt. Lauderdale, an assortment of Mediterranean cruises and Northern Europe, along with transatlantic sailings. Rick Sasso, president and CEO, has brought his incredibly fast-growing cruise lines into the American market, and spas are big factors in the stream of new ships coming into service. “Today’s customer wants a lot,” Sasso observed, “some more than a lot.” People have more money these days and are spending more on themselves – upgraded air, high-end hotel stays, because they have wealth. The 16,000-square foot Aqua Spa wellbeing center is designed with a thermal cave, steam room and sauna, Turkish bath, glass-fronted relaxation room overlooking the ocean and warm, atmospheric treatment rooms. State-of-the-art fitness equipment fills the gym, where classes from aerobics to yoga will be offered. MSC’s beauty treatments blend ancient and modern practices, using natural minerals, healing salts and aromatherapy along with techniques including electronic stimulation. Thalassotherapy, aromatherapy, anti-wrinkle facial treatments and massage incorporating shiatsu, reflexology and sports therapy are among the most popular offerings. The full service salon has everything from pedicures and hair color to waxing. They have a variety of packages, and if you book one within 24 hours of boarding an MSC ship you receive a discount and additional perks. Special Destination: Wellbeing cruises are focused getting in shape while visiting outstanding destinations, with special menus, experts on board to offer seminars and Thai and Balinese massage, pressotherapy and more in addition to the usual treatments. MSC Lirica departs on a roundtrip Copenhagen cruise May 17 for seven nights in Germany, Norway and Denmark, calling in Kiel, Oslo, Starvanger, Falm, Hellesylt and Geiranger, priced from $1,099 per person. MSC Opera has an August 24 departure sailing 12 nights from Copenhagen to Venice, visiting England, Spain, Portugal, Gibraltar, Malta and Montenegro, priced from $1,299 per person. MSC Orchestra sails roundtrip Genoa September 21 for seven nights, calling in Italy, Tunisia, the Balearics, Spain and France, priced from $1,149.